A recent market study published by the company – “Lateral Flow Assay Market: Global Industry Analysis 2013–2017 & Forecast 2018–2026” consists of a comprehensive assessment of the most important market dynamics. After conducting thorough research on the historical as well as current growth parameters of the lateral flow assay market, the growth prospects of the market are obtained with maximum precision. The lateral flow assay market report features unique and salient factors that are likely to have an impact on the development of the lateral flow assay market during the forecast period. It can help market players modify their manufacturing and marketing strategies to envisage maximum growth in the lateral flow assay market in the upcoming years. 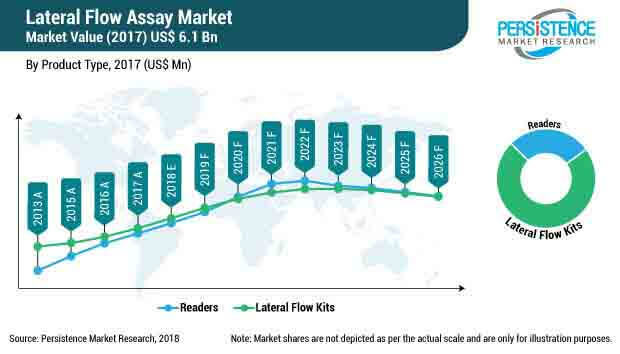 The report provides detailed information about the current and future growth prospects of the lateral flow assay market in the most comprehensive manner for the better understanding of readers. The report commences with an executive summary of the lateral flow assay market, which includes a summary of the key findings and key statistics of the market. It also includes the market value (US$ million) and volume (units) estimates of the leading segments of the lateral flow assay market. Readers can find detailed taxonomy as well as the definition of the lateral flow assay market in this chapter, which will help them understand the basic information about the lateral flow assay market dynamics, opportunity analysis, pricing analysis, the list of key market participants and consumer adoption processes by major countries. Moreover, this chapter elaborates the regulatory scenario, pricing impact analysis, parent market, and the competition blueprint of the lateral flow assay market. This chapter includes a detailed analysis of the growth of the North America lateral flow assay market, along with a country-wise assessment that includes the U.S. and Canada. Readers can also find market growth and market attractive analysis based on product type, indications, distribution channel, and countries in the lateral flow assay market of North America. Readers can find detailed information about the pricing analysis that is impacting the growth of the Latin America lateral flow assay market. This chapter also includes the growth prospects of the lateral flow assay market in the leading LATAM countries such as Brazil, Mexico, and the Rest of Latin America. Important growth prospects of the lateral flow assay market based on its product types as well as distribution channels in several European countries, such as EU4, UK, Russia, and the rest of Europe, are included in this chapter. India, China, Japan, ASEAN, Australia and New Zealand are the leading countries in the Asia pacific region that are the prime subjects of assessment to obtain the growth prospects of the Asia Pacific lateral flow assay market in this chapter. Readers can find detailed information about the growth parameters of the Asia Pacific lateral flow assay market during the period 2018–2026. This chapter provides information about how the lateral flow assay market will grow in the major countries in the MEA region, such as GCC Countries, South Africa, and the rest of MEA, during the period 2018–2026. In this chapter, readers can find a comprehensive list of all the leading stakeholders in the lateral flow assay market, along with detailed information about each company, including company overview, revenue shares, strategic overview and recent company developments. The market players featured in this report include QIAGEN N.V., F. Hoffman - La Roche Ltd., Becton, Dickinson and Company, Abbott, bioMerieux S.A, Bio-Rad Laboratories Inc., Hologic Inc., Danaher Corporation (HemoCue AB), Thermo Fisher Scientific Inc., and Siemens Healthcare GmbH, among others. Based on the product type, the lateral flow assay market is segmented into readers and lateral flow kits. In this chapter, readers can find information about key trends and developments in the lateral flow assay market and market attractive analysis based on the product type for each region. Based on the indication type, the lateral flow assay market is segmented into infectious diseases, pregnancy tests, and drug of abuse. In this chapter, readers can find information about the key trends and developments in the lateral flow assay market and market attractive analysis based on the indications for each region. Based on the distribution channel, the lateral flow assay market is segmented into hospital pharmacies, retail pharmacies, supermarket/hyper markets, and e-commerce. In this chapter, readers can find information about the key trends and developments in the lateral flow assay market and market attractive analysis based on the distribution channel of each region. This chapter explains how the lateral flow assay market will grow across various geographic regions such as North America, Latin America, Europe, Asia-Pacific (APAC), and the Middle East & Africa (MEA). Technological advancements are resulting in functional improvements in lateral flow assays in terms of sensitivity, selectivity, and progress in quantification. The test readers developed by manufacturers are widely used to measure the intensity of the test line of a sample. Growing miniaturization and portability has enhanced the adoption of handheld lateral flow assay readers. Technological advancements for utilizing unique wavelengths for sample illumination, along with various sample detection techniques, which include either CMOS or CCD detection technology, is driving innovations in lateral flow assay testing devices. Moreover, the introduction of test-specific advance image processing algorithms have improved the quantification of sample analytes. The lateral flow assay market is expected to increase as these kits can be used without much training and expertise. Alternative non-optical technologies, such as Magnetic Immunoassay (MIA) and the usage of the capillary pumping of the sample fluid to reduce variations in sample volume are gaining traction in the market. Home diagnosis has become a trend as self-test kits are easily available in pharmacies, hospitals and as well as online channels. Home test kits are available for several conditions and indications, which include high cholesterol levels, diabetes, blood sugar levels, pregnancy tests and infections such as HIV. Most of the home-based lateral flow assay kits are quick & easy to use and generally require a urine sample or a finger-prick. The manufacturers of lateral flow assays are increasing their proficiency by developing and designing qualitative, quantitative, and visual- and reader-based products. The popularity of home-based lateral flow assay test kits has grown significantly in emerging countries, such as India, China, and South Africa, where the prevalence of infectious diseases, such as diabetes, tuberculosis, and HIV, is increasing. The competition section of the report features the profiles of key players operating in the lateral flow assay market based on their market shares, product offerings, differential strategies, company dashboard, and marketing approach. Some of the key players featured in the Lateral Flow Assay market report are QIAGEN N.V., F. Hoffman - La Roche Ltd., Becton, Dickinson and Company, Abbott, bioMerieux S.A, Bio-Rad Laboratories Inc., Hologic Inc., Danaher Corporation (HemoCue AB), Thermo Fisher Scientific Inc., and Siemens Healthcare GmbH, among others. The key manufacturers of lateral flow assay focusing on new marketing strategies to expand their product penetration and geographical footprint in the global lateral flow assay market. Lateral flow assays are immuno-chromatographic tests that help detect the presence and absence of target analytes such as pathogens in samples. They do not require hi-tech and expensive equipment, however, various lab-based applications are available, which are supported by the reading equipment. Lateral flow assays are generally used for diagnostics for home testing, laboratory use and point-of-care testing. The most widely applied and well-known applications of lateral flow assays are home pregnancy tests. The report consists of lateral flow assay kits for the diagnosis of pathogens in humans. However, lateral flow assay kits are also used for detecting infections in animals and contamination in water supply, animal feeds & other sources. Lateral flow assays are available in two types: readers and lateral flow assay kits. The readers quantify the results, whereas the kits provide a qualitative analysis that indicates the presence or absence of disease. Lateral flow assay readers are of two types: bench top and handheld. These devices are low-cost, compact, low-power and battery-operated devices that require only few accessories, but offer great flexibility to patients as well as the lab technicians. Lateral flow assay kits consist of a dipstick, lancets, a cassette, and test strips for the detection of pathogens. The sample is placed on a test device and the results are visualized by a change in color owing to conjugate formation. The company has conducted a research study on the lateral flow assay market for the forecast period 2018 to 2026. The lateral flow assay market report offers a comprehensive evaluation of the business opportunities present in the lateral flow assay market, along with insights on the lateral flow assay market pricing impact analysis, consumer adoption process, volume of the kits, parent market analysis, regulatory scenario, iceberg analysis, epidemiology for the diseases, and the competition blueprint of the lateral flow assay market. The report also explains the macroeconomic factors that are affecting the dynamics of the lateral flow assay market and its futuristic potential. The lateral flow assay report offers a comprehensive taxonomy of the lateral flow assay market based on product type, indication, end user, and region. Lateral flow assays are used for various indications, such as urine analysis, mosquito borne diseases, sexually transmitted diseases, Streptococcus infections, tuberculosis, respiratory infections, and others. The distribution channel of the lateral flow assay market includes hospital pharmacies, retail pharmacies, supermarket/hypermarkets and e-commerce. Based on product type, the global lateral flow assay market is segmented into readers and lateral flow kits. The lateral flow assay market has been analyzed across the regions of North America, Latin America, Europe, Asia Pacific, and the Middle East & Africa (MEA). What is the revenue potential of the lateral flow assay market across the regions of North America and Europe? Who are the key competitors in the lateral flow assay market and what are their portfolios in the lateral flow assay market? What are major challenges influencing the growth of the lateral flow assay market?